Allure Large by Jon Renau is a refined pixie cut with short, feminine layers. The wig is made with pre-styled, ready-to-wear synthetic hair that looks and feels like natural hair. The open wefting in the basic cap creates better air ventilation, which provides more coolness on the scalp. It's breathable and lightweight for a more comfortable fit. You can achieve several different looks with this short, layered wig. 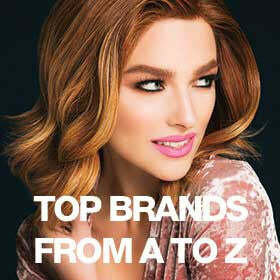 Use synthetic styling products by BeautiMark to achieve different textures. Allure also comes in petite and average cap sizes, as well as a "Mono" version with a monofilament top. Approximate Length: Front 3.75" | Crown 4.5" | Sides 3" | Nape 2"